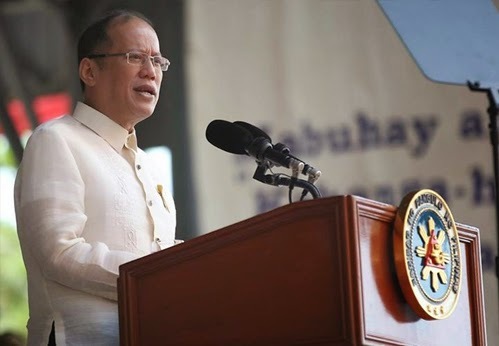 SPEECH and PHOTOS: President Aquino at the commemoration of Araw ng Kagitingan, April 9, 2015 - Balita Boss! Below is the official English translation of the speech given by President Benigno S. Aquino III during the commemoration of Araw ng Kagitingan at Mt. Samat, Bataan, on April 9, 2015. Almost three generations have passed since Bataan fell. After intense fighting, Filipino and American soldiers were forced to surrender to the Japanese. Now, we gather once more to pay tribute to the collective valor of those who fought in that era. As we recognize their heroism, we stand united with former allies and foes in continued pursuit of widespread peace and prosperity throughout the world. Our commemoration of this Day of Valor is accompanied by the celebration of Philippine Veteran’s Week. To our veterans: The Filipino people honor the bravery you showed as you defended our freedom and fought for a better future. This is why we must protect and promote your rights, the same way you exhibited such compassion and commitment towards your fellowmen and your country. Through good governance, we have improved and expanded the benefits you receive. Our primary focus has been cleaning up and correcting the list of veterans who receive benefits through the Pensioner’s Revalidation Program. Of course, it is only fair that legitimate veterans receive full benefits, and that no unqualified individual receives a share. This is why we are pleased with the Philippine Veterans Affairs Office’s improved enforcement of our Validation Program, through formal agreements with its partners—whether they are banks, financial institutions, local civil registrars, or other agencies of government. There is more good news: The records of our veterans are no longer handled manually; they are now digitized. Because of this initiative, the validity rate of our pensioner accounts list rose to 99.95 percent in 2014. The money set aside for you now goes directly to you. In fact, as of March 2015, the number of pension accounts of living veterans and of dependents of injured or deceased veterans handled by the PVAO has increased to 198,169. Meanwhile, through the services of our Veterans Memorial Medical Center and of 601 other public hospitals in various parts of the country, we are making sure that veterans receive the necessary healthcare. Part of our efforts is the provision of daily medical subsidies for veterans when they get confined at a health facility. We also extend financial assistance for operations concerning cataracts, coronary angiogram, angioplasty, cardiac bypass, and chemotherapeutic agents. Since July 2010, 8,760 veterans and their dependents have benefitted from this service, which in sum amounts to 81.6 million pesos. We also provide subsidies for medical products such as orthopedic implants and prosthesis, hearing aids, and dentures. On top of this, since July 2010, the state has supported 15,571 dependents of our veterans in their studies. Under the Educational Benefits Program of PVAO, financial assistance amounting to 36,000 pesos is provided to each qualified student every year. Since assuming office we have allocated 305.2 million pesos for this program. As we can all see: The state is taking care of our veterans. We are also making sure that we continue to care for the active members of our armed forces and national police. Whether here at home or abroad, they truly demonstrate the caliber of our uniformed services. They confront dangers that are, at times, unimaginable or beyond what were agreed upon. I say this on behalf of our countrymen: We salute our uniformed services for the valor they demonstrate, and all the Filipinos who are ready to stand for principle, regardless of the challenges set before them. By commemorating this Day of Valor, we reflect upon the lessons of history, so that we may learn to never repeat its failures, and instead move forward together towards that which we seek to accomplish. After three generations, with the blessing of hindsight, we clearly know the causes that led to the world wars. It is said that after the First World War, the victors oppressed the vanquished. Traditional punishment was received not only by leaders, but also by ordinary citizens. Because of hardship, they lost hope; from this hopelessness, Fascism and National Socialism were born. These conditions led to the Second World War. And what did we get from this war? As I have often said, so much damage was wrought. More than a million Filipinos perished. This is a staggering number, especially since our population numbered only about 16 million then. It is reported that Manila was second only to Warsaw among Allied capitals in terms of damage sustained during the war. That is why we so admire the generation of veterans and leaders during this era. After such a devastating war, instead of bearing grudges, they chose peace. Through proper processes, they held the leaders of defeated countries to account, and helped uplift the rest of the world. The entire world stood in solidarity: Never again should such a tragedy take place; no one wins in a war. Is it not true that even the victors and survivors needed to rebuild from the ashes? From such an insight, the opportunity rose: Because of their decision, adversaries became partners. Nations that once needed help, such as Germany and Japan, are now extending aid in pursuit of global peace and progress. In our part of the world, since then our country was able to hurdle so many challenges, especially through the help of the United States, Japan, and the other members of the international community. In times of calamity, are they not always there to extend support and respond to our needs? In fact, their help has become a given; it has become a question of how quickly this help will arrive. For example, the United States and Japan responded immediately after we were hit by Typhoon Yolanda in 2013. Thousands of personnel were deployed by their governments, along with ships and aircraft to deliver relief goods and ferry our countrymen to safety. Beyond this, they extended financial aid to rehabilitate affected communities. Of course, in their time of need, we likewise extended the help we can afford without hesitation. Clearly, progress cannot be achieved through mere individual action. Conflict can only lead to more suffering and misunderstanding, while solidarity brings widespread benefit. This is the same lesson that leads us to champion lasting peace in Mindanao, and to call for the passage of the Bangsamoro Basic Law. Imagine: Those who were once our enemies are today our partners in realizing a just peace for all. In coming together to foster stability in Mindanao, all the more are we able to widen the scope of opportunities available to our countrymen. In doing this, no one will be driven to join radical factions, terrorist groups, and others interested only in pursuing their selfish agendas. Two generations have already suffered due to the violence that has dominated Mindanao. Now that we are here, we will not allow succeeding generations to suffer the same fate. However hard our task may be, whatever challenges we may face, we will continue to pursue peace, because this is the way to obtain justice for all. We are well aware: The trials we face as a country, even those we face today, are indeed serious. Among these are the dangers brought by pandemics, the disasters caused by climate change, and the spread of fear and violence by terrorists. If we fail to unite, many more opportunities will be wasted; many more lives will be claimed by chaos, and many more livelihoods destroyed by lack of understanding. The challenge is to strengthen our solidarity further, and tread a single direction towards the fulfillment of our collective aspirations. Let us remember: Despite our differences, we live in and share a single world. The legitimate concern of one is a concern of all. This is the crossroads before us: Shall we help to solve problems while they are still small, or remain indifferent and face an even more formidable challenge in the future? I recall what my father said: If you allow others to trample upon the rights of your fellowmen, you have allowed the trampling of your own rights. Now that we are treading the straight path, we are, little by little, seeing a future in which, though challenges may remain, we have the capacity to overcome them, and in so doing, to avoid passing them on to those that will follow us. This remains to be the spirit behind the efforts of various nations to forge our synergies and tread a single path towards the realization of our shared aspiration. Let me emphasize: This generation has the responsibility of maintaining peace, and of continuing the pursuit of widespread prosperity. This is the vow that the Philippines makes, not only for the victims of past wars and violence, but also for present and future generations of Filipinos, and for the rest of our brothers and sisters across the globe. To read the untranslated speech, please cick here. For more photos of commemoration ceremonies of Araw ng Kagitingan 2015, please click here.